Seminaries, Days of study, Team Building... Trust our teams to organize all your professional events and strengthen the links between your collaborators. With its bay windows looking out over the trees in the garden, the restaurant's dining room is bathed in natural light. Its decor and its chic, relaxed ambiance are conducive to intimate conversations and other confidential exchanges. Not to mention the capitals, pilasters and columns which imbue the place with so much soul and an abundance of elegance. 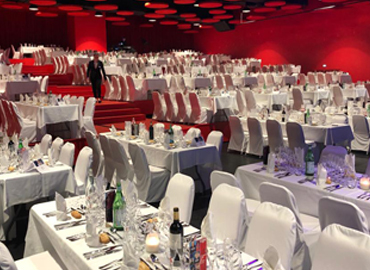 Our brand new casino in Pornic just opened in November 2018. Banquets, weddings, training days, seminaries... The casino, ideally located between the botanical garden and the old Pornic harbour will seduce you thanks to its reception ability, its flexible event spaces and its innovatives solutions. Just for your benefits, a fully flexible 800 m2 performance hall, with a capacity going from 10 to 900 people, we also have 3 additional trade fairs, from 27 to 186 m2. Our spaces use the most advanced equipements, and will tend to the needs of all your requests. Each of your private or professional events is a challenge that we will take up by your side. Our qualified staff know how to advise and adapt to your requirements and your expectations.